The scenery now was very different to Yosemite, much more arid and stark yet beautiful in its own right. After not having time to visit the ghost town of Bodie to the east of Yosemite on the way to Lone Pine, I did a little research and came across a place called Keeler which was directly on our way to Death Valley. But Keeler is only "semi ghost" in that there are still around 60 people living there. Keeler had been a mining town and also something of a lakeside resort, sitting on the edge of the once-100 square mile Owens Lake. In 1917 the city of Los Angeles started diverting the streams that fed Owens Lake, eventually resulting in a dried up lake with unpleasant dust storms for the inhabitants of Keeler. The town has been mostly abandoned and is now more than a mile from the "shoreline" which is little more than marshy mud pits surrounded by an endless expanse of salt flats where the temperature can easily reach over 100 degrees on summer days, sometimes as high as 150. We pulled off CA136 and drove along a rough road into the heart of the place. But it wasn't clear whether the rusting cars and sun-bleached wooden buildings were abandoned or in use. I didn't feel that it was right to start taking pictures of the place and so we decided to continue on to Death Valley. We made our way from Lone Pine to Panamint Valley. 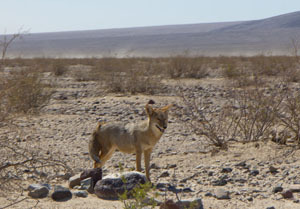 At one point the cars in front stopped and we saw a coyote at the roadside. A sand storm blew in as we crossed the valley bringing with it dry, hot air. Entering Death Valley we stopped at Stovepipe Wells and browsed the gift store before buying our National Park pass at the ranger station next door. The temperature was 108F which we thought pretty hot, but it was to get a lot hotter. At 115F we put Musty's roof up and switched on the air con, but more was to come! We continued south along the Badwater Road, stopping off at the Mesquite Flat sand dunes on the way. 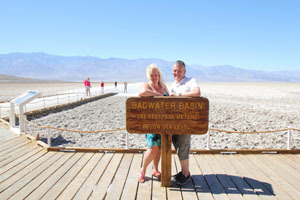 At 282 feet below sea level, Badwater Basin is the lowest point in the contiguous 48 states. It was very windy and hot that it took your breath away so we stopped purely for photos and a drink of water. Working our way back north from Badwater we detoured along Artist's Drive where Musty recorded an outside temperature of 129F, the hottest we were to experience in Death Valley! Back at Furnace Creek we turned off along the road to Zabriskie Point and a bit further to Dante's View for a final look across the wide flat valley of Death Valley before continuing towards the state border with Nevada. The drive in Nevada to Las Vegas was pretty uneventful, especially after Death Valley, so we just kept driving until we reached the Las Vegas strip and tried to find our hotel, The Luxor, for two nights in the desert city. As per road trip rules the sun was setting and in our line of sight as we tried to navigate to park Musty up at the hotel.